Moonlight Productions and Musik Lives Here present David Starfire, FreQ Nasty & Dub Kirtan All Stars (Duo) on November 9th at the Zebra Cocktail Lounge. This is a 21 event. FreQ Nasty is an international touring DJ and music producer of all things dub-wise and bass heavy, including 808 trap music, post-dubstep, breakbeat, and glitch-hop. His musical origins were forged in four separate nations (Fiji, New Zealand, UK, and USA) and he also studies and teaches Yoga Philosophy and Buddhism, including the ‘Yoga of Bass’ series of workshops. 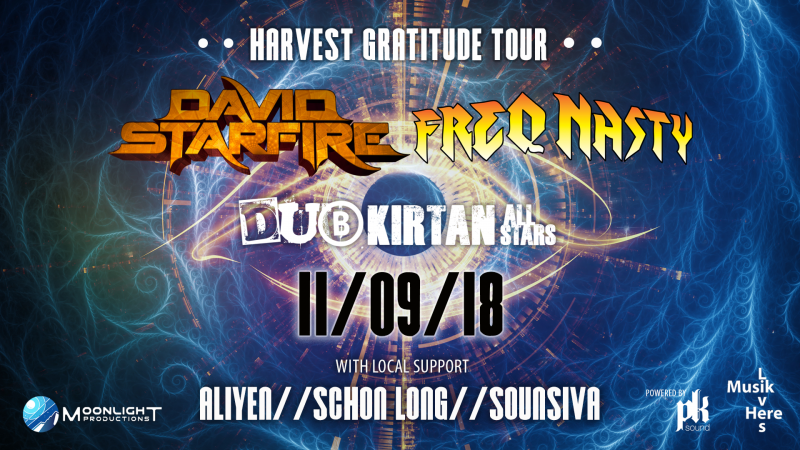 Dub Kirtan All Stars was formed by international touring bass music DJs and Producers David Starfire and FreQ Nasty with the intention to fuse bass-heavy underground music with Yoga Kirtan, the call and response chants of Indian devotional traditions. They are a live musician/DJ collective that tears down the boundaries between bleeding edge technology and ancient spiritual techniques, performer and audience, the sacred and everyday life. Don’t think, just feel the bass, dance and hear your voice ring out above it - the real All Stars are the audience - your voices complete the band.